«Аквамен» Джеймса Вана за перший вікенд китайського кінопрокату зібрав 94 млн. доларів. The tide was with Warner Bros/DC’s Aquaman this weekend in China where the James Wan-directed pic splashed out on a huge $93.6M (RMB 644.8M) opening. This is the biggest Middle Kingdom launch frame ever for WB, surpassing Ready Player One by 66%, and the best ever for the month of December. As we noted on Saturday, it is also the top bow for a DC title in the market, coming in 92% above Justice League, 78% over Batman V Superman: Dawn Of Justice, and exceeding the lifetime of Wonder Woman in just three days. Playing on 33,000 3D screens, Jason Momoa’s Arthur Curry/Aquaman had the 4th biggest opening weekend for a superhero movie in China, behind Venom which bared its fangs last month and whose stellar run has been extended. That Sony film crossed $850M worldwide this session and now has $268M in China. The splashy Aquaman bow is a win for the DCEU in China, which has Marvel mania but has been less rabid about DC. It tops the launches of such MCU titles as Captain America: Civil War, Ant-Man And The Wasp, Spider-Man: Homecoming and Black Panther. IMAX also got along swimmingly with Aquaman audiences this session. The format’s three-day was $9.7M to break local records for the best DC bow and best December launch ever. Playing on 559 IMAX screens, the film includes 92 minutes of specially formatted footage produced exclusively for IMAX theaters. After WB got its release date — which falls two weeks ahead of domestic and should allow for positive momentum to build — the studio heavily promoted Aquaman locally. Online sentiment has been high and this weekend continued to be strong. Next weekend, Aquaman heads to 40 more markets including the UK, Russia, Mexico and Brazil. He’ll have some overlap with Sony’s Spider-Man: Into The Spider-Verse which is the main major studio release next weekend as it begins offshore rollout. While Aquaman was doing his thing in China, the rest of the international box office saw continued strong play from Fox’s Bohemian Rhapsody which crossed the $400M mark overseas to overtake Deadpool 2 as the studio’s biggest offshore grosser of 2018. Globally, it’s at $595.7M. Universal/Illumination’s The Grinch is closing in on $100M overseas as it gets ready to unwrap in China next frame. Uni’s Peter Jackson-produced/scripted Mortal Engines revved up in 43 markets with a $17.9M debut. Warner Bros’ Fantastic Beasts: The Crimes Of Grindelwald also swept past $400M abroad while Disney’s Ralph Breaks The Internet broke the $100M threshold and $250M globally with another 50% of markets still to open. Breakdowns on the films above and more have been updated below (scroll down for earlier Aquaman reports from Friday and Saturday). We watched all weekend as Warner Bros/DC’s Aquaman filled its gills in China, surfing well ahead of pre-opening estimates that were in the $60M-$70M range. With a $93.6M start on 33,000 3D screens, the James Wan-directed origin story is the biggest Middle Kingdom launch frame ever for WB, surpassing Ready Player One by 66%, and the best ever for the month of December. It’s also the top bow for a DC title in the market, coming in 92% above Justice League, 78% over Batman V Superman: Dawn Of Justice, and exceeding the lifetime of Wonder Woman in just three days. The Friday-Saturday jump was a stunning 55% while Sunday sank just 14%. Starring Jason Momoa, the movie hopped over the Great Wall two weeks ahead of domestic release and one week before it dives into 40 other overseas markets including the UK, Russia, Mexico and Brazil. It will have some overlap with Sony’s Spider-Man: Into The Spider-Verse in the UK and Russia, but not Mexico and Brazil. Latin America goes big on DC and curiosity is likely to be driven by the outsize China numbers. The studio recoups just 25% from Middle Kingdom turnstiles, but Aquaman should have muscular fins. Next weekend, China sees the release of The Grinch, Searching and Indian pic Padman. DC jumped out of the water with Aquaman in the Middle Kingdom where tastes lean to the MCU. WB got its release date in mid-October and reached for the high-water mark by ramping up local promotion. Momoa, Wan and Amber Heard all visited the market where WB is partnered with key online outlets and social media platforms including Weibo and WeChat. Online sentiment remains high with a Maoyan score of 9.5, Taopiaopaio at 9.2 and Douban at 8.4. Aquaman will top the lifetimes of the previous DCEU movies in the market, including Justice League which finaled at $106M. The Middle Kingdom was ultimately the top hub for each of the earlier pics. Universal’s fantasy epic revved up in 43 offshore markets this session, scoring No. 1s in 17 with a total debut of $17.9M. The movie has a 38% RT score off just 34 reviews with a 91% wannasee. It bows domestically next weekend and is expected to look to international for the bigger play. Maze Runner and Assassin’s Creed are the comps Uni is using. Those pics finaled offshore at $246M and $186M, respectively. Based on the Philip Reeve book and written by Jackson and his Lord Of The Rings fellows Fran Walsh and Philippa Boyens, the story sees the mysterious Hester Shaw (Hera Hilmar) join forces with Anna Fang (Jihae), a dangerous outlaw with a bounty on her head, and Tom Natsworthy (Robert Sheehan), an outcast from London, to lead a rebellion against a giant predator city on wheels. Russia was the top market this session with $4.1M at 1,466 locations and a No. 1 start. Korea chipped in $1.6M at No. 5 from 421 locations. The growing South East Asian markets are largely No. 1 debuts including Indonesia ($1.6M/318), Malaysia ($770K/147) and Thailand ($631K/142). The next markets to release in the crowded holiday corridor include France, Italy, Germany, the UK and Spain. Talk about legs. Fox’s Bohemian Rhapsody is still strutting its stuff with an added $29.2M from 72 markets this session. That brings the offshore cume to $423M and global to $595.7M meaning it will pass $600M this week. The weekend hold was a supersonic-22% and the Freddie Mercury biopic has become Fox International’s highest grossing film of 2018 (exceeding Deadpool 2), and is Fox International’s 12th biggest title ever (topping the original Deadpool). Korea again led all play for the session, lifting the cume to $54.3M off a 25% drop. Japan again jumped, by 1%, for a cume of $39M after five frames. Italy in its 2nd week dipped just 16% and has now bested the lifetime of La La Land with $14M. Down Under, the Australia total is $25M to leap past The Greatest Showman. The UK continues as the top market for Rami Malek & Co with $57.2M. Universal/Illumination’s The Grinch is approaching the $100M mark offshore with a $98.9M cume through Sunday. The weekend in 61 markets was $25.9M with nine openers and an overall 28% dip. Worldwide, the gross crossed $300M for $322.4M to date. Mexico was a No. 1 launch at 865 locations and with $5.24M for 52% market share. This is in line with Boss Baby, above Moana and Big Hero 6 and more than double Trolls and Sing. In holds, Germany (which is one of the offshore majors that leans into all things Seuss-ian) had a great 12% drop for a $7.2M cume after two frames (the Saturday was up 9% from open). The UK fell by just 17% to close in on $25M at $24.8M. There, The Grinch has already topped the lifetimes of Coco and Ferdinand and is the biggest Dr Seuss movie ever. France, Australia, Italy, Spain and the Netherlands also saw terrific holds. Behind the UK and Germany, the Top 5 is rounded out by France ($6.5M), Australia ($5.34M) and Mexico. Next weekend adds Japan and China. With another $22M in Newt Scamander’s case, Warner Bros’ spinoff sequel now has an offshore cume of $423.3M for $568.5M worldwide. The David Yates-helmed Wizarding World entry is playing in 80 markets. Japan led the frame at No. 1 again off a 28% drop and now has a $34.6M cume. Overall, the Top 5 markets are China ($57.1M), the UK ($37.5M), Japan, Germany ($33.3M) and France ($27M). Continuing its staggered release overseas, Disney’s domestic champ Ralph Breaks The Internet slotted another $18M in just 30 material markets including a No. 1 opening in Spain. The offshore cume is $117.3M for $258.2M worldwide. Spain embraced Ralph with $4.6M over five days and the 2nd biggest Disney Animation opening ever. Israel held onto the No. 1 spot for the 3rd consecutive weekend while the UK maintained No. 1 in its 2nd session. In Latin America, the sequel also opened No. 1 in Bolivia and Paraguay. Chile, Colombia, Trinidad and Venezuela maintained the top position in the weekend chart. Some notable holds include Israel (+81%), Portugal (-21%), Chile (-30%), Singapore (-39%), Taiwan (-39%), South Africa (-40%) and the UK (-40%). China leads all play with $38.5M in the market that’s been dominated by Aquaman, Venom and local pic A Cool Fish. Mexico is next with $15.1M followed by Russia ($12.1M), the UK ($9.4M) and Spain ($4.6M). Key upcoming debuts are in Japan, Australia, Italy, Korea, Brazil, Germany and France through early February. Lionsgate’s Taron Egerton/Jamie Foxx take on the classic tale added $7.5M from 74 markets to lift overseas to $38.5M. As expected thus far, Russia is the top market with $3.8M after two weeks. Spain debuted on $905K this session. Germany comes aboard on the underwhelmer January 10. Warner/MGM’s sequel punched up $5.2M in the session in 31 offshore markets. The cume is now $23.2M after three frames. The UK is leading the boxing pic with $8.9M, followed by Australia ($4.4M), the UAE ($1.7M), Greece ($556K) and India ($555K). The previous movie did best in the mature European majors that have a history with Rocky, as well as Brazil and Mexico. The latter releases January 1, with France, Russia, Japan, Germany, Italy, Brazil and Spain stepping into the ring later that month. Screen Gems’ horror pic exorcised $4.8M in its sophomore outing, playing on 3,200+ screens in 34 markets for an international cume of $11.5M. Comps The Gallows and Slender Man did $20.2M and $21M, respectively, throughout their offshore runs. The best scores followed the general horror line of Latin America and English-speaking hubs. Upcoming key Hannah Grace markets include Germany and Italy in January and Russia in February. Fox’s female-fronted Widows snared $4.5M in 59 markets this session to bring the international haul to $26.9M after three frames. The Steve McQueen-directed film enjoyed good openings in Germany ($516K/387 screens) and Indonesia ($320K/298) and had good holds in France ($2.4M to date) and Spain ($1.7M). PREVIOUS, SATUDAY: Warner Bros/DC’s Aquaman continued its big China splash on Saturday with an estimated $37.2M (RMB 256M), a 55% increase over Friday’s strong launch. The local cume is now $61.2M (RMB 421.3M) with an $85M+ opening weekend in store. This is a big win for the DCEU in the Middle Kingdom which leans into Marvel but has so far been a bit wishy-washy on DC. With today’s numbers factored, the James Wan-directed Aquaman has already surpassed the opening weekends of Batman V Superman: Dawn Of Justice, Wonder Woman and Justice League in dollar values and in just two days. Aquaman is currently tracking ahead of BVS by 54%, Justice League by 69% and more than double Wonder Woman. The two-day cume has also topped that of WB’s own Ready Player One from last spring by 71%. The Trident of Neptune wielded 85% Middle Kingdom market share on Saturday, built off great word of mouth. Local scores see Maoyan holding at 9.5, Taopiaopiao at 9.2 and Douban at 8.4. WB got an early China release for the Jason Momoa-starrer and took a deep dive on local promotion which is clearly hitting its mark — and more. Friday’s bow (see below) set an all-time record for the studio and was the best December Day 1 ever, although the confirmed numbers ($24M/RMB 165.3M) are slightly lower than yesterday’s estimate. It’s possible that in local currency the full weekend sets a new high-water mark for the month. Aquaman heads to 40 more offshore markets next weekend, then adds 28 the following frame when it also bows domestically. We’ll have a full update on Sunday. PREVIOUS, FRIDAY: Warner Bros/DC’s Aquaman took his first strokes in China today, grossing an estimated $24.6M (RMB 169.5M). The studio has been pulling out the stops locally as the Middle Kingdom is launching the Jason Momoa-starrer two weeks ahead of its domestic release. The DCEU has not had the draw in China that the Marvel Cinematic Universe has enjoyed, but Aquaman is poised to hit a high-water mark for the DC brand with a possible $80M+ debut weekend. Already, the flash estimate on 30,500 screens, 100% of which are 3D, is the highest opening day ever for a WB title and the best industry opening day ever for December. The film commanded 86% market share on Friday. Online sentiment is high with a Maoyan score of 9.5, Taopiaopaio at 9.4 and Douban at 8.4. Previous DC outings Batman V Superman: Dawn Of Justice, Wonder Woman and Justice League had full China opening frames of $57.2M, $51.8M and $38.2M, respectively and at unadjusted rates. The Middle Kingdom was ultimately the top market for each of those pics (Suicide Squad did not release there), although just Justice League cracked the $100M mark at cume. 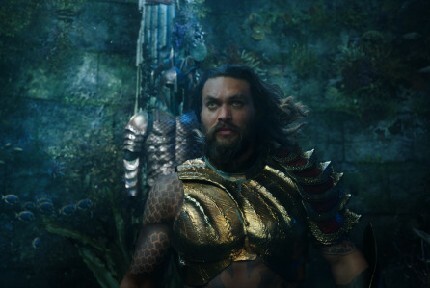 Directed by James Wan, the standalone sees Momoa’s Arthur Curry/Aquaman learn he is the heir to the underwater kingdom of Atlantis, and that he must step forward to lead his people, becomiung engaged in a perilous quest for ancient secrets. Amber Heard, Patrick Wilson, Niocole Kidman, Willem Dafoe, Dolph Lundgren, Djimon Hounsou and Yahya Abdul-Mateen II also star. The character dates back to 1941 in the comics; Momoa was briefly introduced as the seafaring loner with superhuman strength in Dawn Of Justice and then in a bigger role in Justice League. Aquaman got its China release date in mid-October and leveraged that to get the word out locally. It’s still rare for a movie to debut in the Middle Kingdom ahead of domestic, but we have seen some examples of this before. Warner went hard on local promotion. Momoa, Heard and Wan all visited the market where WB is partnered with key online outlets and social media platforms including Weibo and WeChat. The 25 minutes of footage that was shown early locally was met with enthusiastic social response which looks to be paying off now that the film has opened. Aquaman has the distinction of being the first superhero movie WB has released during Christmas. BVS was a March/Easter movie, Wonder Woman played in summer and Justice League hit the domestic Thanksgiving corridor last year. The movie may benefit overseas from school holidays kicking in earlier while in China nothing much has made an impact recently in the wake of the outsize performance of Sony/Marvel’s Venom (which last week was granted an extended release so will still be playing this frame). Looking back at the China comps for Aquaman, BVS in 2016 delivered the then-biggest opening day of all time for a WB film with $20M (RMB 128.7M). In the Middle Kingdom it finaled at $95.8M with the UK, Brazil, Mexico and Australia rounding out the Top 5 for an ultimate $543M international box office cume. Wonder Woman’s China bow was $38.2M for its opening frame with $90.5M through the run. Her top markets were China, Brazil, the UK, Australia and Mexico, and her final offshore gross was $409.2M. Justice League did $51.8M (RMB 343.8M) for the Middle Kingdom launch weekend, taking $106M there at final. The overseas total was $429M with Brazil, Mexico, the UK and Oz falling in line behind China. Before North America on December 21, Aquaman next session swims to 40 more overseas markets including Russia, Brazil, Mexico and the UK. Another 28 will be added the following weekend including Korea and France. He heads Down Under on December 26 and goes to Italy January 1 and Japan February 8. We’ll have more China updates throughout the weekend.